The Suns, who visit the Nuggets on Friday, have won five of seven away from home. The Phoenix Suns were on the brink of their longest winning streak in more than three years before losing their last time out. But facing a Denver Nuggets squad potentially without Ty Lawson, as well as a key reserve, and the Suns figure to have a good chance to get back on track when the teams meet in Denver on Friday night. Phoenix, which has won five of its last seven away from home, squandered an opportunity for a sixth straight victory with Wednesday’s 108-101 home loss to San Antonio. The Suns (14-10) grabbed a five-point lead after one period after Channing Frye scored 15 of his 22 in the first 12 minutes, but the Spurs controlled the rest of the game. The Suns were hurt late by Manu Ginobili, who had 11 points during a 15-6 San Antonio run over the final 4:11. Phoenix’s starting guard tandem of Goran Dragic and Eric Bledsoe were a combined 12 of 33 from the floor, failing to take advantage of a Spurs backcourt that was missing Tony Parker. 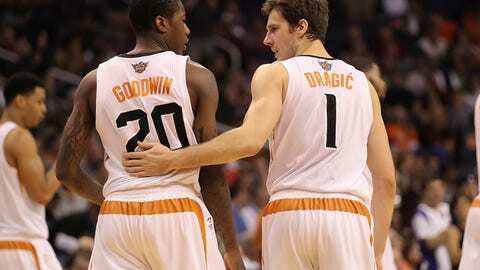 "We know that we can play well against good teams," Dragic said. "We are a young team and we have to learn a lot, especially in these types of games where, in the last three or four minutes, you have to close out the game, and I think we can get there." While the result wasn’t what the Suns were looking for, they stayed hot from 3-point range by going 7 for 15. They’re shooting 43.4 percent from beyond the arc over the last six games and 37.7 percent on the season. It remains to be seen if they can continue that success against Denver, which is limiting opponents to an NBA-low 32.4 3-point percentage, including a 26.2 mark over the last five contests. 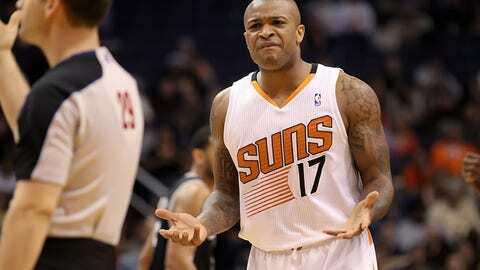 Phoenix was 9 of 20 in a 114-103 home win Nov. 8 after losing eight of nine in the series. Markieff Morris scored a career-high 28 points on 10-of-13 shooting after totaling 27 points in his previous five games against Denver (14-10). Lawson scored a game-high 29 and is averaging 20.6 points on 58.2 percent shooting over his last five versus the Suns, but he didn’t practice Thursday due to the stomach flu and is day to day. Denver won at Philadelphia and Washington earlier this month as he sat out due to a sore hamstring. Jordan Hamilton, one of Denver’s top perimeter shooters with a 38.6 3-point percentage, will be serving a one-game suspension after throwing a punch in an altercation with Oklahoma City’s Steven Adams in Tuesday’s 105-93 home defeat. The Nuggets had won 10 of 13 before losing to the Thunder, finishing with only five second-chance points despite 13 offensive rebounds. J.J. Hickson had 20 points on 7-of-13 shooting and 14 rebounds, but starting forwards Wilson Chandler and Kenneth Faried combined to go 12 of 27. "We fought," coach Brian Shaw told the team’s official website. "I liked our spirit in terms of fighting, but we couldn’t finish in the paint." Phoenix finished with the NBA’s most fast-break points in a game this season in the first meeting, outscoring Denver 37-32 in transition. The Suns lead the league with 19.7 fast-break points per game.